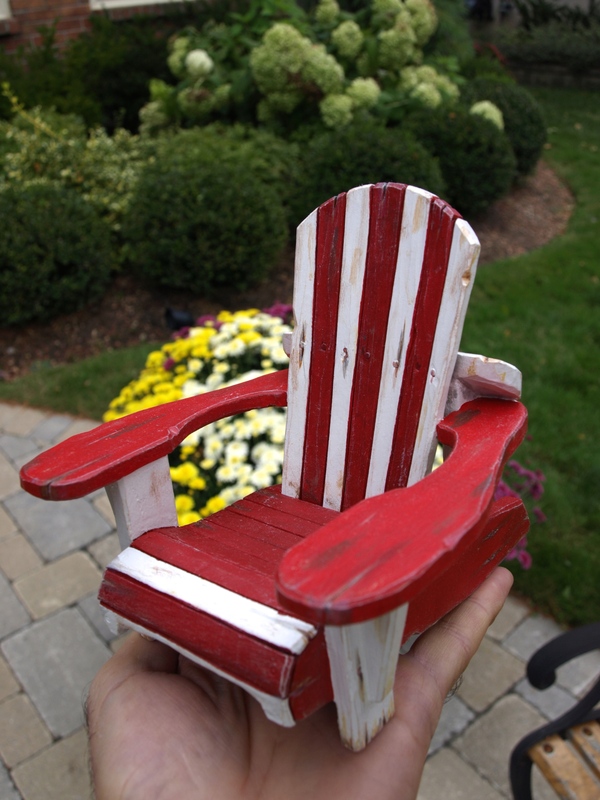 I actually tried a number of different paint schemes for the Muskoka chair as they come in pretty much every colour of the rainbow and a variety of different themes…solid colours, alternating colours, stained wood, etc. The one thing in common, though, is that they tend to be well used and having sat out in the weather for the summer season ( and the winter if you forgot to bring them in ), they tend to look a bit weather worn. I ended up with a red and white chair. The white is actually a bit off-white and the red is Tuscan Red. I then used burnt umber, raw sienna, yellow ochre and a slate grey to highlight some worn areas and add a bit of “dirt.” I then dry brushed the entire piece with a mixture of burnt umber and white and, finally, coated the entire chair with satin polyurethane, being careful to wipe off the excess to ensure a dull finish. I like the way that it turned out and I think the little hound in his bathing suit is going to look like he’s visiting his favourite spot on the beach and sitting in his go-to chair.